Pioneers in the industry, we offer explosives packaging bag from India. Baroda Packaging offers the complete range of ANFO bags (Laminated and Non Laminated) with and without additional liner. 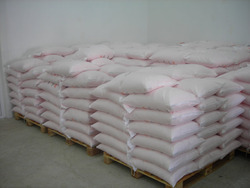 Since, this category of ANFO bags are especially used for the packaging of fine grade ANFO Explosives, we even provide these bags with an additional liner on customer's demand, which not only protects the product from external elements but also ensures complete safety against any sort of leakage and pilferage.